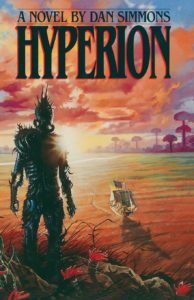 I acknowledge it’s unfair of me to review Dan Simmons’ entire Hyperion Cantos together because it’s a long, complex journey with highs and lows in terms of both narrative drama and writing quality. In many ways, it’s less a four-book series, and more a duology of duologies. Unfortunately, the first two books are far superior than the latter two, which mainly serve to button up the universe. 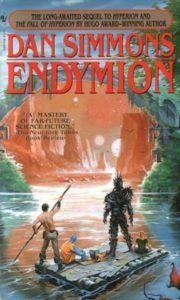 If these books interest you at all, I might recommend reading only the first two; however, the Endymion books might compel you, and you might find yourself beginning to resent them and questioning whether it was worth beginning the series in the first place. I realize this review has already crashed and burned. It probably sounds as if I dreaded these books. I didn’t. In fact, I really enjoyed them and would go so far as to say I loved the first two while the second pair are immensely satisfying. There is a lot of weird stuff going on in these books. In fact, it doesn’t just skirt the line of shoving every sci-fi idea Simmons ever had into a single narrative and hoping it works. It Air Jordans over that sucker from half court and slam dunks those ideas in your face. Yes, exactly like Space Jam, another science-fiction classic. What’s exceptional about Hyperion, however, is all of these crazy sci-fi shenanigans work. For the most part, that is. Toward the end, it really goes off the rails. The conclusion I draw in my notes is Hyperion is like the Battlestar Galactica reboot before there was a Battlestar Galactica reboot. You know how that series begins so brilliantly but can’t sustain its stature and there’s a steady decline in writing quality and it can’t deliver on its promises and that ending, tho? The Hyperion Cantos is a similar experience. When it’s all over, it’s bittersweet because it’s this stunningly creative work with unique and memorable elements, but Simmons unabashedly shatters a handful of literary rules that exist for good reasons, and then he provides fictional justification for breaking those rules (with winks and nods) as if that makes how he cheapened the story okay. It doesn’t, Dan. It really doesn’t. Most of this happens in the Endymion books. For starters, the first two books hint at the Shrike being more than just this horror show robot monster of death and destruction. In fact, it’s clear that it’s doing everything it does with a purpose we just aren’t aware of yet. While its presence over the entire narrative is powerful considering how few pages the thing actually appears on, the Shrike turns out to be a literal deus ex machina, and it’s supremely disappointing to discover nothing in this story could have happened if not for the intervention of the Shrike. 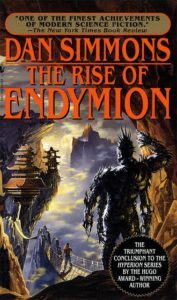 If you haven’t read the Endymion books and haven’t reached that realization, don’t feel bad. Because the next thing is Raul Endymion, the character Simmons, through his meta-character self, literally tells you is the hero of the story, is actually a passive participant. He’s an observer. Almost nothing he does influences the story’s outcome at all. In fact, he screws up a lot more than he gets right, and he makes some mind-numbingly dumb decisions. There’s a revelation at the end in which our true hero reveals Raul’s role in the narrative, and it’s “good enough” to make sense of how Raul could be so incredibly inept and not only survive as long as he did (not a spoiler since he’s telling this story, which implies he survives) but also not cause the universe to spin fantastically into disaster. Except it’s not good enough. Because of Raul’s role in the story, the Hyperion Cantos turns out to be more an exercise in the futility of fate than a moving tale of heroic struggles and universal conflict. In short, nothing could have turned out any differently despite a prophet’s claims that all she sees are possibilities and that things can always change. For an epic series, these are massive issues, but let’s set them aside. Ultimately, these books are fascinating and stunning works of creative genius. Sure, Simmons took the rules of storytelling out back, beat them with a spiked baseball bat, and set them on fire, and that’s bothersome, but there is a lot here that is utterly compelling. What’s most interesting to me about the Shrike’s effect on the story is, in total, reading these books is less like following a narrative and more like seeking to understand it. It is so steeped in philosophy and theology that its power is broadly in communicating these huge ideas about the nature of existence. More than anything else, that’s what makes it Simmons’ magnum opus. There are a lot of meta-literature and self references, but to give Simmons credit, they’re at least veiled. You can see his hand quite often, but I think Simmons knew what he was doing and at least tried to offer explanations in the fiction for it. It does become too much, but Icarus should be applauded for the effort. Indeed, the Hyperion Cantos amazingly imaginative, and that is its finest attribute. It isn’t only that Simmons created a fascinating universe filled with believable and unique characters complete with their own diverse histories and cultures that represent humanity in a way so few writers can. It’s that he consistently challenges himself with insane ideas then legitimizes them over and over again. 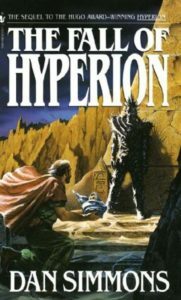 In a way, for any aspiring sci-fi writer, Hyperion might be terrific study material. I would advise you not to do with Simmons did in total, but I think it could be valuable to take portions of Simmons’ work and source it for inspiration. The Hyperion Cantos is ultimately a series that crumbles under its own weight of existential and philosophical questions, but it’s finer points break through the static. If you can forgive Simmons for the noisy transmission, you’ll find a wealth of treasures worth your time. Tagged Books, Reviews, Science Fiction.